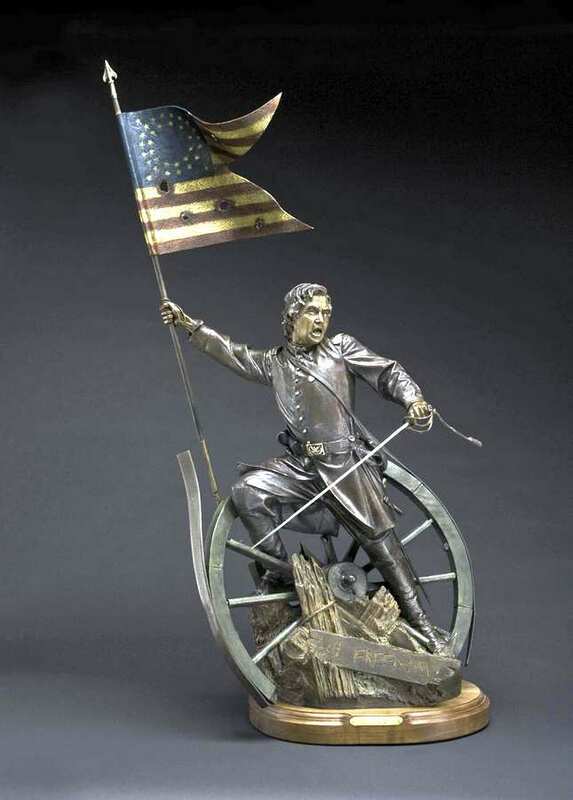 This sculpture depicts a Civil War Union Cavalry officer advancing with the swallow-tail National Colors over a contested battlement. Symbolically, it represents the United States of America armed with the Sword of Truth leading the way to bring "Freedom" and true Liberty to the world. Notes: The title is from the classic Civil War Union song "Battle Cry of Freedom". The "Sword of Truth" (M1860 US Cavalry Sabre) will win out over the gun (.44 cal Henry) of tyranny which now lies trampled in the mud under the feet of the courageous American warrior (1st D.C. Cavalry). The wheel of life that has turned for eons under the weight of despotism is now shattered, as America fulfills her true destiny of Liberator for the world, in word and deed - leading the way by example.